Dimensions 2 by 5.75 by 8.75 in. 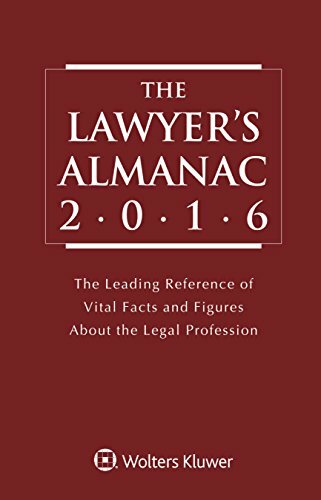 Amazon.com description: Product Description: The Lawyer's Almanac provides vital facts and figures on the courts, government, law schools, lawyers, and their work and organizations. Complete and up-to-date, it is the standard reference guide on the American legal scene and is useful for attorneys, law librarians, judges, law students, journalists, and anyone who needs quick access to information on the legal profession. The Lawyer's Almanac reflects the size and density of the legal profession. It includes a detailed listing of the nation's 700 largest law firms, along with their contact information, data on law firm finances, and detailed statistical analysis of corporate attorney compensation. About: The Lawyer's Almanac provides vital facts and figures on the courts, government, law schools, lawyers, and their work and organizations.